People with untreated severe hearing loss are five times more likely to develop a form of dementia. Research has shown a strong link between hearing loss and Alzheimer type dementia and other dementias. People with severe hearing loss are five times more likely to develop a form of dementia. Even those with mild hearing loss have double the chance of acquiring the condition than people with normal hearing. One study led by Dr Frank Lin, Professor of Geriatric Medicine at Johns Hopkins University in the US, shows auditory impairment is associated with a 30-40 per cent rate of accelerated cognitive decline. His team is now trying to identify if better treatment of hearing loss could reduce dementia rates. The relationship between hearing loss and dementia is shrouded in complexity. For example, dementia is not a disease but a presentation of symptoms that occur when the brain stops working properly. Also, many people wrongly view ‘dementia’ as ‘Alzheimer’s disease’. In reality, there are more than 100 diseases that are linked to dementia. Alzheimer’s disease is the most common cause accounting for up to 70 per cent of people with dementia. Some forms of Alzheimer’s and frontotemporal dementia (which usually affects behaviour before memory) can be genetic. But most dementias are not inherited. It is important to note that typical hearing loss does not cause Alzheimer’s disease and not everyone with hearing loss will develop a dementia. Also, people can show Alzheimer symptoms but have dietary, hormone deficiencies, cognitive difficulties or depression. In these cases, the symptoms may be reversible. The most common dementias – Alzheimer’s and cerebrovascular disease (damage to the brain’s blood supply) – have no cure. The disease progression varies but people usually live four to eight years after an Alzheimer diagnosis but can survive 20 more years. So improving communication between doctors and audiologists and finding better ways to support and test people for hearing loss and dementia is becoming increasingly urgent. Can hearing aids help prevent the onset of Alzheimer type dementia? Part of the problem is that hearing loss and dementia have many similar symptoms. But Emma Scanlan, Principal Audiologist at Australian Hearing, explains patients can do a lot to improve quality of life – starting with early diagnosis, a good support network and the use of hearing aids. 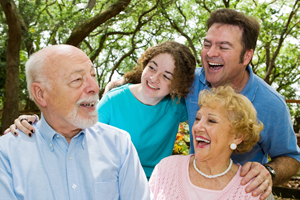 “Dementia can be overestimated or misdiagnosed due to hearing loss,” says Scanlan. “I was seeing a lady in a closed dementia unit in an aged care facility who was considered to have a very significant level of dementia – but actually she had a severe hearing loss which had never been diagnosed or treated,” says Scanlan. “Once she had a hearing aid, she was able to move out of the unit,” she explains. So what can be done to identify and assist those at risk? Consulting a doctor and an audiologist is the obvious first move. But more research is needed to analyse the overlap between the two conditions. Wearing hearing aids – earlier rather than later – can help. Dr Anil Lalwani and his team, at Columbia University Medical Center in the US, published a study in the American Journal of Geriatric Psychiatry last year. “Our study suggests that using hearing aids may offer a simple, yet important way to prevent or slow the development of dementia by keeping adults with hearing loss engaged in conversation and communication,” explains Dr Lalwani. This is supported by a study on cochlear implantees with cognitive decline who were found to have improved mental ability a year after surgery (although they also received auditory rehabilitation which may have influenced this result). Here, we look at the many positive actions that can be taken to stave off cognitive decline and the research that is paving the way to the better diagnosis of both conditions. Having a supportive family is critical in improving communication and wellbeing for people with hearing loss and dementia. Maintaining empathy and composure, ensuring you are facing the person when talking to them in a well-lit area and speaking up can make a big difference, says Scanlan. Greg Savage, Professor of Clinical Neuropsychology at Macquarie University, says research backs up the importance of familial support. “We have found that when a family member is helping in cuing, the overall performance is much better than when a partner is not helping in that way,” explains Professor Savage. If a relative suspects hearing loss or the early signs of dementia, suggesting a hearing test is a sensitive way of addressing the topic. “Sometimes a hearing test can be a good first step to make, rather than admitting you think someone is developing dementia because they are becoming forgetful,” says Scanlan. She adds that feeling cross or frustrated with the person will only increase their fear of social interaction. Encouraging a healthy, low fat, low sugar diet is also sensible as diabetes has been linked to hearing loss and Alzheimer’s disease, and high blood pressure and raised cholesterol increase the risks of vascular dementia. But having ways that allow for early diagnosis and intervention are key to improving outcomes. “Most people wait seven to 10 years before they do anything about it. During that time psychological and social impacts of hearing loss can be far-reaching,” says Scanlan. “One thing we do know is that it’s not so much the hearing loss itself but hearing loss that hasn’t had any intervention that seems to cause the most impact on the affected individuals, their partners and families,” she says. This entry was posted	on Monday, March 20th, 2017 at 12:36 am	and is filed under News. You can follow any responses to this entry through the RSS 2.0 feed. Both comments and pings are currently closed.